The Allied Control Council or Allied Control Authority, known in the German language as the Alliierter Kontrollrat and also referred to as the Four Powers (German: Vier Mächte), was the governing body of the Allied Occupation Zones in Germany and Austria after the end of World War II in Europe. The members were the Soviet Union, the United States, the United Kingdom, and France. The organization was based in Berlin-Schöneberg. The council was convened to determine several plans for postwar Europe, including how to change borders and transfer populations in Eastern Europe and Germany. As the four Allied Powers had joined themselves into a condominium asserting 'supreme' power in Germany, the Allied Control Council was constituted the sole legal sovereign authority for Germany as a whole, replacing the extinct civil government of Nazi Germany. It is recognized that, in view of the chaotic conditions to be anticipated in Germany, whether a capitulation occurs before invasion or after invasion and consequent establishment of military government, an initial period of military government in Germany is inevitable and should be provided for. The EAC also recommended the creation of a tripartite US, Soviet, and British agency to conduct German affairs following the surrender of the Third Reich. The British representative at the EAC, Sir William Strang, was undecided on whether a partial occupation of Germany by Allied troops was the most desirable course of action. At the first EAC meeting on January 14, 1944, Strang proposed alternatives that favored the total occupation of Germany, similar to the situation following the First World War when Allied rule was established over the Rhineland. Strang believed that a full occupation would limit the reliance on former Nazis to maintain order within Germany. He also believed that it would make the lessons of defeat more visible to the German population and would enable the Allied governments to carry out punitive policies in Germany, such as transferring territories to Poland. The main arguments against total occupation were that it would create an untold burden on Allied economies and prolong the suffering of the German population, possibly driving new revanchist ideologies. However, his final conclusion was that a total occupation would be most beneficial, at least during the initial phase. In August 1944, the US government established the United States Group to the Control Council for Germany, which served as a liaison group within the EAC for planning the future occupation of Germany. The chairman of this group was Brig. Gen. Cornelius Wendell Wickersham. As the German collapse approached, Strang became convinced that Germany was about to undergo a total collapse, in which case a total occupation and control would be inevitable. He even proposed a draft declaration to be issued by the Allied governments in case no political authority remained in Germany due to chaotic conditions. For a brief period, this prospect was feared by some Allied representatives. After the death of Adolf Hitler on 30 April 1945, Karl Dönitz assumed the title of president of Germany in accordance with Hitler's last political testament. As such, he authorised the signing of the unconditional surrender of all German armed forces, which took effect on 8 May 1945, and tried to establish a government under Ludwig Graf Schwerin von Krosigk in Flensburg. This government was not recognised by the Allies, and Dönitz and the other members were arrested on 23 May by British forces. This imposition was in line with Article 4 of the Instrument of Surrender that had been included so that the EAC document, or something similar, could be imposed on the Germans after the military surrender. Article 4 stated that "This act of military surrender is without prejudice to, and will be superseded by any general instrument of surrender imposed by, or on behalf of the United Nations and applicable to GERMANY and the German armed forces as a whole." In reality, of course, all German central civilian authority had ceased to exist with the death of Hitler and the fall of Berlin at the latest. These parts of the Berlin declaration, therefore, merely formalised the de facto status and placed the Allied military rule over Germany on a solid legal basis. An additional agreement was signed on 20 September 1945 and further elaborated the powers of the Control Council. The actual exercise of power was carried out according to the model first laid out in the "Agreement on Control Machinery in Germany" that had been signed by the United States, the United Kingdom, and the Soviet Union on 14 November 1944 in London based on the work of the EAC. Germany was divided into four zones of occupation—American, French, British, and Soviet—each being ruled by the Commander-in-Chief of the respective occupation forces. "Matters that affect Germany as a whole," however, would have to be decided jointly by all four Commanders-in-Chief, who for this purpose would form a single organ of control. This authority was called the Control Council. The purpose of the Allied Control Council in Germany, like the other Allied Control Commissions and Councils which were established by the Allies over every defeated Axis power, was to deal with the central administration of the country (an idea that hardly materialised in the case of Germany, as that administration totally broke down with the end of the war) and to assure that the military administration was carried out with a certain uniformity throughout all of Germany. The Potsdam Agreement of 2 August 1945 further specified the tasks of the Control Council. On 30 August 1945, the Control Council constituted itself and issued its first proclamation, which informed the German people of the Council's existence and asserted that the commands and directives issued by the Commanders-in-Chief in their respective zones were not affected by the establishment of the Council. :44 The initial members of the Control Council were Marshal Georgy Zhukov for the Soviet Union, General of the Army Dwight Eisenhower for the United States, Field Marshal Bernard Montgomery for the United Kingdom, and General Jean de Lattre de Tassigny for France. Proclamations – "to announce matters or acts of special importance to the occupying power or to the German people, or to both". Laws – "on matters of general application, unless they expressly provide otherwise". Orders – "when the Control Council has requirement to impose on Germany and when laws are not used". Directives – "to communicate policy or administrative decisions of the Control Council". Instructions – "when the Control Council wishes to impose requirements direct upon a particular authority". Law no. 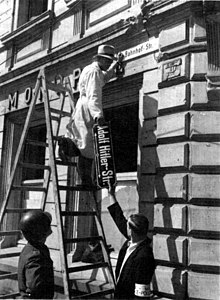 1 of the Control Council (also enacted on 20 September 1945) repealed some of the stricter Nazi laws enacted under the Third Reich. This established the legal basis for the council's work. Shortly after the commencement of the Nuremberg Trial, the council enacted Law no. 10 (20 December 1945), which authorized every occupying power to have its own legal system to try war criminals and to conduct such trials independently of the International Military Tribunal then sitting at Nuremberg. :Vol 1, 306–311 Law no. 10 resulted from disagreements arising among the Allied governments regarding a common policy on war criminals and marked the beginning of the decline in inter-Allied cooperation to that effect. Following the conclusion of the Nuremberg Trial of Major War Criminals in October 1946, inter-Allied cooperation on war crimes totally collapsed. One major issue dealt with by the Control Council was the decision made at the Potsdam Conference regarding the forced removal of German minorities from Czechoslovakia, Hungary and Poland to Allied Occupied Germany. On November 20, 1945, the council approved a plan to that effect, to be completed by July 1946.:Vol. I, 199–201 France, not having been a party to the Potsdam conference, reserved the right not to be bound by any agreements made there; and accordingly refused to accept German expellees into the French zone of occupation. Relations between the Western Allies (especially the United States and the United Kingdom) and the Soviet Union subsequently deteriorated, and so did their cooperation in the administration of occupied Germany. Within each zone each power ran its own administration, such as the Gouvernement Militaire de la Zone Française d'Occupation en Allemagne (GMZFO) in Karlsruhe, the Soviet Military Administration in Germany (Russian: Советская военная администрация в Германии, СВАГ; Sovetskaia Voennaia Administratsia v Germanii, SVAG) in East Berlin, the Control Commission for Germany - British Element (CCG/BE) in Bad Oeynhausen, and the Office of Military Government, United States (OMGUS) in West Berlin and Frankfurt. Already in September 1946, disagreement arose regarding the distribution of coal for industry in the four occupation zones, and the Soviet representative in the council withdrew his support of the plan agreed upon by the governments of the United States, Britain and France. Against Soviet protests, the two English-speaking powers pushed for a heightened economic collaboration between the different zones, and on 1 January 1947 the British and American zones merged to form the Bizone. Over the course of 1947 and early 1948, they began to prepare the currency reform that would introduce the Deutsche Mark, and ultimately the creation of an independent West German state. When the Soviets learned about this, they claimed that such plans were in violation of the Potsdam Agreement, that obviously the Western powers were not interested in further regular four-power control of Germany, and that under such circumstances the Control Council had no purpose any more. 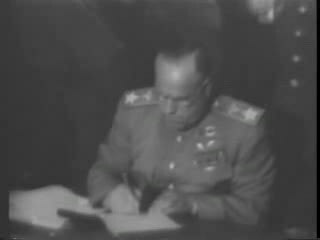 On 20 March 1948, Marshal Vasily Sokolovsky, the Soviet representative, walked out of the meeting of the Council, never to return. As the Control Council could only act with the agreement of all four members, this move basically shut down the institution, while the Cold War reached an early high point during the Soviet blockade of Berlin. The Allied Control Council was not formally dissolved, but ceased all activity except the operations of the Four-Power Authorities, namely the management of the Spandau Prison where persons convicted at the Nuremberg Trials were held until 1987, and the Berlin Air Safety Center. The Western powers instituted the Allied High Commission by September 1949 which remained in operation until 1955, and which approved the Basic Law for the Federal Republic of Germany. In Eastern Germany, the Soviet administration with its representative of the ACC was the highest authority, later this position was converted to a High Commissioner as well, until the German Democratic Republic gained sovereignty. In establishing the Allied Control Council as the supreme authority for Germany and the sole legal repository of German national sovereignty, the Allied Powers of 1945 had envisaged that this sovereignty would eventually be passed on to a new German state, once a unified German government adequate for the purpose had been established. The breakdown of the Allied Control Council therefore created a constitutional dilemma for both the nascent Federal Republic and GDR governments, as neither new state could claim formal approval of their constitutions from the full Control Council; and it was unclear how otherwise they might claim legitimate sovereignty over the parts of Germany under their control. The Allied Control Council met once again in 1971, leading to the Four Power Agreement on Berlin. During the talks for unification of Germany in late 1989, it was decided to convene the ACC again as a forum for solving the issue of Allied rights and privileges in Germany. Germany remained under nominal military occupation until 15 March 1991, when the final ratification of the Treaty on the Final Settlement With Respect to Germany (signed on 12 September 1990) was lodged with the German Government. This, as the final peace treaty signed by the four powers and the two German governments, formally restored full sovereignty to a reunified Germany. It also meant the official end of the Allied Control Council. The Council had held its final meeting on 2 October 1990, on the eve of the reunification of Germany, when it promulgated the formal documents – already agreed in advance – that authorized the inclusion of the city of Berlin in the German reunification. This was necessary because, until then, West Berlin was legally not a part of the Federal Republic of Germany, although it was administered by it. But with the allied Souveränitätserklärung (Sovereignty Declaration) agreed in the Council, the Federal Republic was allowed to assume legal control of Berlin at the moment of German reunification (although the withdrawal of the Allied military presence had to wait until 1994, in accordance with the timeframe provided by the Treaty on the Final Settlement with Respect to Germany). During its short active life, the Allied Control Council was housed in and operated from the former building of the Kammergericht, the supreme court of the state of Prussia, which is situated in Berlin's Schöneberg borough in the American sector. The building itself had suffered some battle damage, losing a central tower, but had remained mostly usable. After the cessation of most council activity in 1948, all occupying powers quickly withdrew from the building to their respective sectors of the city, leaving the facility cold, empty and dark. Only one four-power organisation, the Berlin Air Safety Center (BASC), remained in the building from 1945 until December 31, 1990. As a symbol of the BASC's continued presence, the four national flags of the occupying powers still flew over the large front doors every day. The only other signs of occupancy were the few, sparse office lights that emanated from a small corner room of the building—the BASC Operations Room—in the evenings. Of the 550 rooms in the building, the BASC office complex and guards' quarters occupied fewer than forty. Because of the BASC's presence, the building remained closely guarded by United States military guards, with access granted only to select members of the four powers. This led to mysterious legends and ghost stories about the eerie, dark facility with its grand, granite statuary overlooking the beautiful park. After the fall of the Berlin Wall, and the departure of Russian troops in August 1994 (a withdrawal that took place in accordance with article 4 of the Two Plus Four Treaty), the building was returned to the German government. In 1997, its erstwhile occupant, the Kammergericht, moved in. It now functions as the supreme court of the state of Berlin. ^ The U.S. Army in the Occupation of Germany 1944–1946. p. 109. ^ "United States--France--Great Britain--Soviet Union; Declaration Regarding the Defeat of Germany and the Assumption of Supreme Authority with Respect to Germany and Supplementary Statements". The American Journal of International Law. 39 (3): 171–178. 1 January 1945. doi:10.2307/2213921. JSTOR 2213921. ^ "Scanned original document at the Franklin D. Roosevelt Library & Museum". ^ a b c d e f g h i j k l m n o p q r s t u v w x y z aa ab ac ad ae af ag ah ai aj ak "Enactment and Approved Papers of the Control Council and Coordinating Committee". Allied Control Authority Germany. 1945. William Durie, " THe UNited States Garrison Berlin 1945–1994", Mission Accomplished, Aug 2014 ISBN 978-1-63068-540-9 (English). Photos from the 1970–71 Four Power negotiations on the Status of Berlin.